A group of about one hundred pneumoconiosis workers from Hunan were stopped from travelling to Shenzhen to show their support for Wei Zhili, the recently detained editor of New Generation, an online media which had been supporting their decades-long struggle for a fair compensation for their occupational illness. On Wednesday 27 March, local authorities in Sangzhi stopped the group of workers at the local train station as they were leaving for the southern metropolis. Sangzhi pneumoconiosis worker representative Gu Fuxiang told China Labour Bulletin that police agents deployed at the station prevented them from making the trip. Despite local government pressure, Gu said that workers would continue to stand for their rights. “I only have one lifetime, and even if I fear reprisals I just simply cannot stop fighting for a fair deal,” Gu said during a phone interview. Gu, a 52 years old father of two children, was diagnosed with the occupational illness in 2009. In 2019, after a medical check-up, his condition was found to have deteriorated. “In 2017 I was a stage 2 patient, earlier this year I was found to have reached stage 3,” Gu stressed. Gu emphasised that Wei, who often visited them in their hometown in Hunan, never told workers to break the law in their fight for a fair compensation. 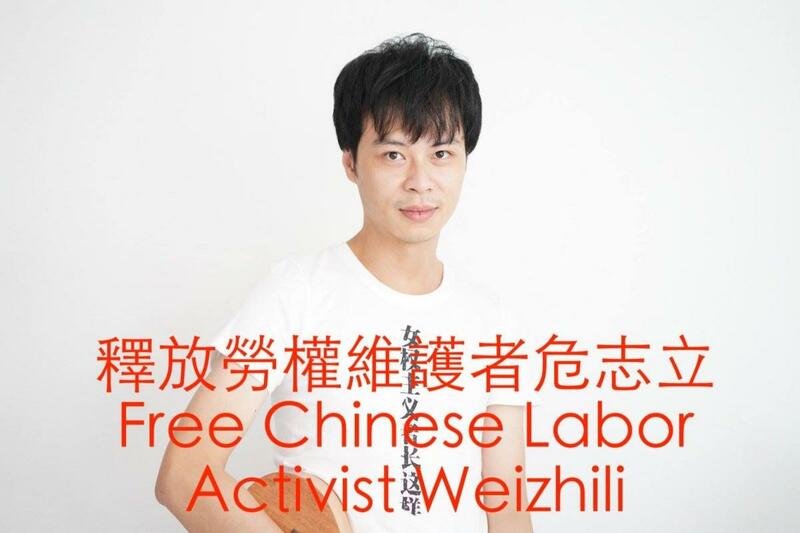 “Xiao Wei always stressed on the importance of respecting the law, in fact he told us many times that in our struggle for justice, we should apply the law to our advantage,” Gu said. Xu Chunlin, another pneumoconiosis worker representative from neighbouring Leiyang, agreed with his colleague in an interview with China Labour Bulletin. “Wei Zhili always reminded workers to follow the law and not block the roads when protesting for our compensation,” Xu said. Around 200 workers and family members from villages in Leiyang, Sangzhi and Miluo in Hunan province staged a series of protests in Shenzhen in November 2018. But after police allegedly used pepper spray to disperse the workers, officials at the municipal Human Resources and Social Security department ultimately agreed to talk. A few weeks later in December, the Shenzhen municipal government finally offered a deal which included a one-off compensation and coverage of medical fees. The compensation package varies from 120,000 yuan for those with a stage one illness to 170,000 yuan for stage two, 220,000 yuan for those with final stage three pneumoconiosis, and 240,000 yuan for the families of workers already deceased. According to official figures, pneumoconiosis is the most serious and most common occupational disease in China. While there is no cure for pneumoconiosis, palliative care and medical treatments are out of reach for these ailing workers with no income. Therefore, a reliable long-term solution that provides regular economic support and covers medical expenses for all these workers and their families has to be set up. Shenzhen government has the means and the obligation towards the thousands of construction workers who sacrificed their health and lives to help build the metropolis in the 1990s and 2000s. See CLB’s research report The Hard Road: Seeking justice for victims of pneumoconiosis in China for more details.